In this most backward of seasons, during which a rookie is the best player in the game, a playoff team shuts down its ace in September when he's healthy, a team sells for more than $2 billion and only an epic collapse stands between the Baltimore Orioles and the playoffs, of course the picture of impermeability is a 35-year-old relief pitcher who last year walked more hitters than he struck out. Oh, those wacky Mayans and their jokes. 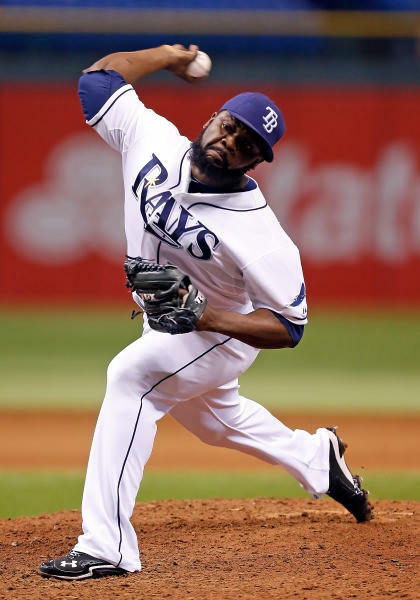 Seriously, Fernando Rodney? Of all the historically insane seasons, Fernando Rodney? Craig Kimbrel and Aroldis Chapman and – Fernando Rodney? By now it's time to kill the question marks, because it's true: Fernando Rodney has a 0.64 ERA, and if there's any lock in baseball at this juncture, it's – gulp – him. We swallow hard because we still can't quite believe it, but then it's Sept. 24 and the Boston Red Sox have yet to win 70 games, so believability remains a bit askew in 2012. A few teams have gone full Rodney already. The Washington Nationals and Cincinnati Reds have clinched playoff spots. All they're playing for is 100 victories and home-field advantage throughout the postseason. The Atlanta Braves are almost in, too, their magic number two and their place in the wild-card play-in game assured absent a full-on Nationals collapse. And beyond that … it's not chaos, per se, but no team among the dozen "contenders" – which includes those in a playoff spot or within 4½ games, an arbitrary cutoff, yes, that excludes a Philadelphia team all of one game over .500 – calm exists on a sliding scale. At 10 Degrees, we do our best to provide cutting-edge insight, and we figured there no better way to quantify that scale than with the latest in face-melting sabermetric technology. Behold: The Fernando Rodney Floating Head scale. Every team gets zero to five Rodneys, depending on just how strong their lock is on a postseason berth going into the last full week of the regular season. 1. Detroit Tigers, who could've been in first place today and then got swept in a doubleheader by a Minnesota team that entered the day with the worst record in the American League. The Good: Miguel Cabrera is a madman (.346/.418/.769 in September and, yeah, leading in each of the traditional Triple Crown categories for the whole season). Justin Verlander may well win his second consecutive Cy Young. Al Alburquerque's return has been a huge boon to a bullpen that needs a fresh arm with Octavio Dotel's blowups of late. The Ugly: Getting swept Sunday by the Twins certainly qualifies. So does a 10-11 record in September despite outscoring their opponents by 13 runs. Oh, and beyond Cabrera, the Tigers' power has disappeared. Without him, they've got 14 home runs in 21 games this month and are slugging .367. 2. Chicago White Sox never has been more evident than following a three-game sweep by the Los Angeles Angels extended the White Sox's losing streak to five and shrunk their division lead to one game. The Good: Well, the cookie part of their schedule is nice. Cleveland is 16-46 since July 19. And as for the cream-filled portion, the White Sox did sweep the Rays earlier this season. Plus their bullpen has been aces this month, from super rookie Nate Jones to Donnie Veal, the long-lost prospect who has reinvented himself as a good-looking lefty specialist. The Ugly: Where to begin? How about with the eight runs scored during the five-game losing streak? Or the 55-game drought since the last time they plated 10 runs? (That would be July 24 against Minnesota.) Perhaps the dreadful Septembers of Kevin Youkilis, Alexei Ramirez and A.J. Pierzynski suffice? This White Sox team is dying by its offense. The group always has run hot and cold. It's high time to fire up the furnace. 3. Los Angeles Dodgers and their quickly diminishing playoff hopes. The Good: Hey, Clayton Kershaw came back! And Adrian Gonzalez hit a pair of homers Sunday after more than a 100-at-bat drought. And they're off to San Diego, where they're 4-2 this season. And Colorado has been almost as bad as the Cubs in the second half. And maybe San Francisco will rest its regulars. And … uh … check, please. The Ugly: Luis Cruz is arguably the Dodgers' best hitter in September. Before this season, Luis Cruz had 4,891 plate appearances in the minor leagues and 169 in the major leagues. 4. Arizona Diamondbacks, who, mind you, were under .500 before Colorado came to town over the weekend. The Good: Straight bombing away in September. An offense with Justin Upton, Miguel Montero, Paul Goldschmidt, Aaron Hill, Chris Johnson and mighty mite Adam Eaton hitting like this strikes fear in even the best pitching staff. The Ugly: There is that 4½-game deficit to wild-card-leading St. Louis, with another two teams to climb. 5. Milwaukee Brewers are an unstoppable machine built for September and trying to pull off the rare dump-at-the-deadline-and-win-anyway move. The Good: Look, for all the studies that say momentum is a myth, there has to be something unquantifiable about a team that starts winning and goes on a roll. I don't know what it is. Players don't. Psychologists don't. But to attribute it all strictly to luck or playing to talent or something that, you know, makes sense. Sorry. Sometimes things don't make sense. Like a team that was 55-66 on Aug. 20 somehow at 79-73 today – and with the hottest pitcher non-Kris Medlen division, Marco Estrada, ready to take the third of four games against the baseball-best Nationals. The Ugly: They've won 22 of 29. Nitpicking would be rude. 6. St. Louis Cardinals stop playing like they should have been all season, which is to say they took care of business in the first two-thirds of their Houston/Chicago/Houston stretch. The Good: Chris Carpenter is back and Shelby Miller has arrived. With Trevor Rosenthal and Edward Mujica, John Mozeliak once again Houdini'd the bullpen into a strength. Only Milwaukee challenges the Cardinals for best lineup in the NL, and it took a crazy run for that to happen. The Ugly: Their final six games against the two best teams in baseball don't exactly bode well, especially if the Nationals and Reds decide not to rest key players. The best thing that could happen to St. Louis is Washington or Cincinnati getting swept early this week and ceding the top seed to the other. 7. Texas Rangers, who would've clinched a postseason berth in almost every other division by now. The Good: The Rangers have shown no inclination to collapse this September. They're 12-9 this month. Take Sunday. When the top of their lineup struggles, the bottom four get on base 9 of 16 plate appearances and score and drive in all three runs, with a Ryan Dempster-Robbie-Ross-Mike Adams-Joe Nathan pitching quartet. Sounds like the sort of thing you'll be seeing a lot in October. The Ugly: There is the matter of the schedule. It is the toughest of any contender. By far. The A's are dynamic and the Angels hot, and neither wants to see Texas in the postseason. Granted, neither has beat up on the Rangers – they're 6-6 against the A's and 8-8 against the Angels – but the possibility remains because it's September and it's 2012 and the Mayans said so, got it? 8. New York Yankees surge of late has quelled the impending sense of panic and doom that permeated this team, oh, you know, two weeks ago. The Good: Minnesota, Toronto, Boston. Or, as they're better known, Pop, The, Champagne. The Ugly: There's the whole matter of winning the AL East, where their lead is one game. The idea of having to host the A's (or the Angels) in a do-or-die game with a just-off-the-DL Andy Pettitte is troublesome. Even worst is Pettitte in a tiebreaker game with Baltimore, followed by CC Sabathia on short rest in the play-in game, which would leave the Yankees' rotation damaged for the division series. 9. Tampa Bay Rays don't pull another where-did-they-come-from run out of thin air. The Good: The Rays have won five in a row to vault within 3½ of the A's. (After they lost seven of eight to force them to win pretty much every game.) They outscored the Red Sox and Blue Jays 46-13 during the streak. It's impressive. And just another reason to be frustrated with a talented club that never quite put it together. The Ugly: It's a numbers game, and the numbers stink for Tampa Bay. They need to win practically every game. And they need the Angels and Orioles to flop. Badly. 10. Baltimore Orioles share that fabric with the team chasing them. The Good: THE ORIOLES HAVE WON 16 STRAIGHT EXTRA-INNINGS GAMES AND ARE 27-9 IN ONE-RUN GAMES. Sorry. There's this thing when absolutely indescribable events take place and MY COMPUTER STARTS TYPING IN ALL CAPS AND WON'T STOP BECAUSE THIS TEAM DOESN'T MAKE ANY SENSE. The Ugly: All these years Orioles fans thought Peter Angelos was the devil. And then in 2012 he goes and makes a deal with him? That's some deep epistemological stuff, man. 11. Oakland A's have seven games against a Rangers team trying to clinch home field. The Good: The A's pulled their second consecutive avoid-a-sweep victory Sunday against the Yankees, chipping away a run at a time, which isn't close to their style. It was a huge win considering the devastation of Saturday's loss, in which Oakland blew a 9-5 lead in the 13th inning. The 4 2/3 scoreless innings from the bullpen Sunday was a classic A's win – Jerry Blevins throwing funk followed by the fastball orchestra of Ryan Cook, Sean Doolittle and Grant Balfour. The Ugly: Josh Reddick has gone into the toilet this month. Brett Anderson is done for the regular season with an oblique strain. And there's the matter of those seven games against Texas. 12. Los Angeles Angels are hot on their tail. The Good: Swept the White Sox. Watched Ervin Santana, Dan Haren and Jered Weaver deal. Have Zack Greinke next and can go back to the other three on full rest – and against the offense that has scored the fewest runs in the major leagues in September. The A's may have a 2½-game advantage on the Angels, but they have the same number of Rodneys for a reason. The Ugly: It's the deficit they've created. It's ugly. Like a zit at which they kept picking, and it worsened, got infected and took the dermatologist to rid. Oh, and there's that whole power struggle between GM Jerry Dipoto and manager Mike Scioscia that with a couple losses will once againt surface, because the only thing that buries bad relations for good is long-term winning. 13. Detroit Tigers jumping aboard Miguel Cabrera's back, and what Cabrera has done is impressive, remarkable, monumental – whatever sort of adjectives you care to reserve for one of the best hitters of his generation. He's not the MVP, of course – tune in next Monday for the 10 Degrees awards presentation – but that's of little material if Cabrera makes the postseason and gets to go for the reward that counts the most. With 10 games left in the season, it's still a race without a clear leader. Not just the AL Central. Almost everywhere in baseball. Every team has its good and its ugly, its hopes and its dreams and, of course, its Rodney Floating Heads. It's September. It's 2012. Even the strongest lock can be broken.